Lazy Seamstress: What to do? layered detail with raw edges., originally uploaded by indiaeden. Just a few months ago I'd imagined life once Sid went to school full time to be full of a new baby, LLL meetings, baby massage classes, Slingmeets. Lots of snuggly breastfeeds on the sofa. I expected to be busy. I'm not, not busy now. There is always the daily efforts to stop the household sliding into utter chaos. Plus I still have plenty of good friends checking in on me and invites out for coffee and lunch. I know though that sometime very soon I'm going to have to start thinking about the future and work. My little business has never made me my fortune,but it kept me busy and paid for treats we might not otherwise have afforded. I wont be going back to making baby carriers. The level of detail and involvement with the customer and their babies is not something I think I could cope with right now. Maybe one day, who knows. So, the thought is there, something to ponder. 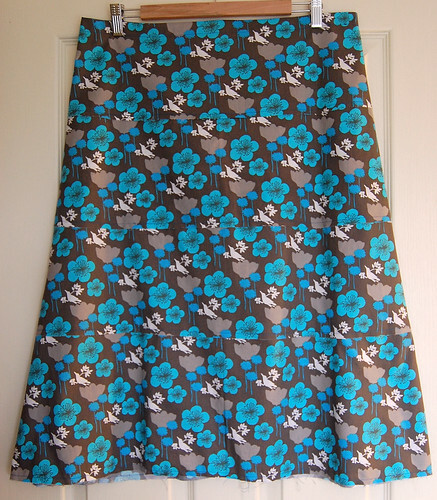 Meanwhile, today I've made a skirt. I could've been cleaning the bathrooms, or making our bed, or cooking tonights tea,but I guess I'll never be a Stepford wife. To hell with the housework and on with the sewing! In the great housework / sewing debate I think sewing should win everytime! Gorgeous. Good job! I too have a zip fear. I had to stop floristry when I was grieving. Too many funerals and and no patience for customers. Got a job as an art technician at the local collage. Hope you can find something you enjoy. I know I found you an amazing teacher. You would be a wonderful textile tutor. beautiful skirt. I so want to learn to sew. I totally understand why you wont be making baby things any longer, it is just too hard to be around it, i know. You really are so talented Jeanette! 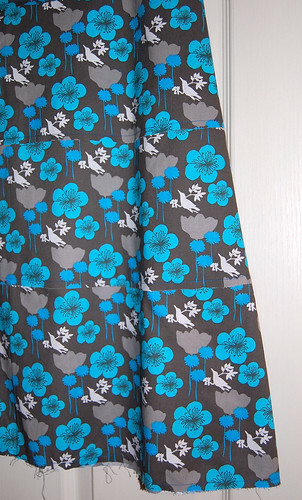 It's a lovely skirt, one of these days I will dust off my machine and have a bash at something like this. I love the pattern, and will be checking out the link! Also love the fabric you have used! Jeanette I would definitely be one of your 1st customers if you ever decide to make beautiful skirts as a business....in fact are you interested in a small commission because I need something bright to wear?? Will email you re cuppa!